This command inserts a block of user-defined data at the specified position. Depending in the current insertion mode, the Insert Immediate Data command either inserts or overwrites the existing data at the insert position. 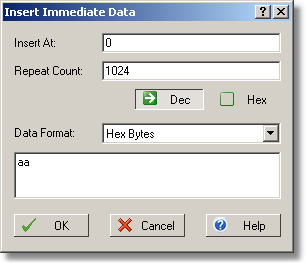 The Insert Immediate Data command works slightly differently from the Insert Zero Block command. While in most cases you can use either command to insert a block of zero bytes, these commands works differently for sparse files. Insert Zero Block inserts sparse zeros, whereas Insert Immediate Data always inserts actual data occupying disk space. 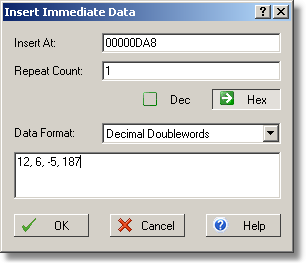 The insertion address and the repeat count may be entered as a decimal or as a hexadecimal number. FlexHEX assumes the number is hexadecimal if it contains hexadecimal digits A to F. Otherwise it is treated according to the Dec/Hex selector. Character strings can be inserted the same way as binary data, except you should use escape sequences to represent special or non-printable characters. Note however that the zero character is not allowed in strings because zero is interpreted as the string terminator. Multi-byte values and UNCODE characters entered are interpreted according to the current byte order setting.